Just because IKEA discontinued the Sandby sofa doesn't mean you have to throw it out! 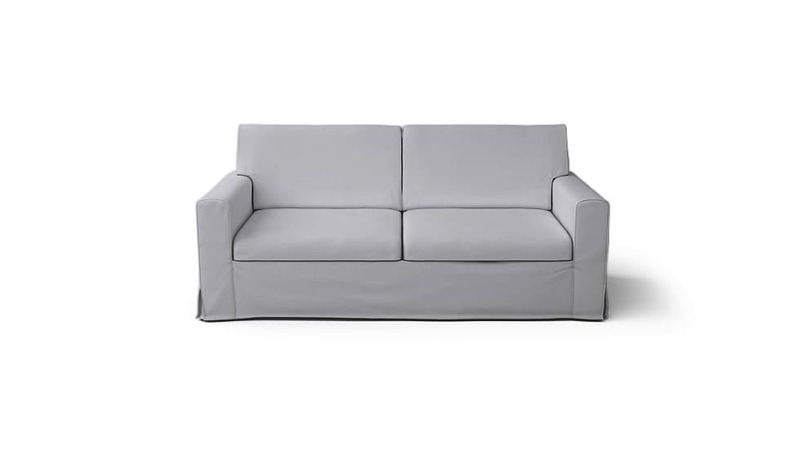 Get a set of custom replacement IKEA Sandby sofa covers and give your Sandby couch a new lease on life. We make sofa covers / couch covers for the Sandby 3 seater sofa, Sandby armchair covers, and Sandby footstool covers. Custom Sandby slipcovers are available for the discontinued 2 seater, 3 seater, armchair and footstool sizes. Pleats and skirts come standard with all our custom Sandby slipcovers. The back cushion cover is made with 1 piece of fabric, so you can flip the cushion to minimize wear. For a more luxurious look, do opt for the linen or velvet fabric blends we have. Frustrated with your old, worn-out looking IKEA Sandby sofa? Make it look better than brand new with our custom IKEA replacement sofa slipcovers. No matter where you are in the world, we'll deliver your custom covers to your doorstep for free. And we don't just aim to get your slipcovers beautifully made and sent to you safe and sound, we also aim to delight you with small touches that make your shopping experience with us a personal one. Choose from over 70 gorgeous fabrics, including linens, leathers, cottons and velvets, and customisations such as pleated skirts, contrast piping and side pockets for a look that's completely your own. Ready to start upgrading your IKEA Sandby? Simply order a pack of fabric samples that you can test at home and let us guide you through the process of designing the perfect IKEA Sandby sofa slipcover for you.